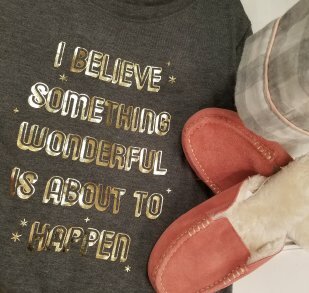 Do you have your PJs ready to PARTY TOMORROW?! Sales, Sub-for-Santa & Social Media Giveaway! Balloons ordered - check. Doughnut holes and hot chocolate in the works - check. Sub-for-Santa prize - check. Social media giveaway started - check. More sale fabric added to the bargain basement - check. P.J.s ready to PARTY - CHECK!!! We hope you've got your P.J.s ready to party because it's time to celebrate Corn Wagon's 19th Birthday at our Pajama Party! Tomorrow, Saturday, November 10th, we will open our doors EARLY at 7:00 a.m. for our biggest sale of the year! Hop out of bed and head right over in your P.J.s for the best discounts and selection. 7:00 a.m. - 9:00 a.m. 30% off ALL regular price items! 9:00 a.m. - 11:00 a.m. 20% off ALL regular price items! 11:00 a.m. - 5:00 p.m. 10% off ALL regular price items! Wear your P.J.s into the store anytime that day to receive an additional 5% off!!! Sale fabric (look for the red dot stickers) will be $3.99/yd all day!!! Discounts cannot be combined and do not apply to services, class fees or block-of-the-month kits. Whether you live near or far away we want you to join the party so we're offering a social media GIVEAWAY! Did you know we are on Facebook and Instagram? Follow us on either (or both!) 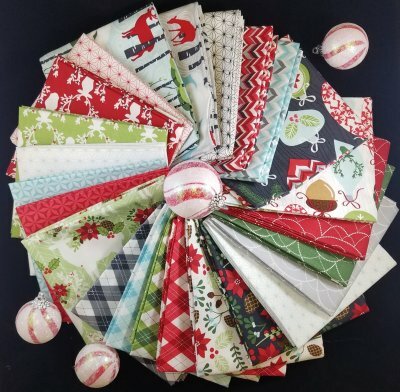 and look for our recent photo like the one shown below to find out how you can win this Rustique Winter fat quarter bundle from Emily Herrick Designs! Visit our website and look for the flag links at the top of our home page. They will take you directly to our Facebook page and Instagram profile anytime. ...and if you're not the lucky winner of this darling bundle, no worries! The fabric is available in-store! For our birthday this year, we invite all our PJ party goers to help us donate to a local Sub for Santa program and receive the chance to win a Corn Wagon Gift Card! One entry per guest. No purchase necessary to enter though we highly encourage a Sub-for-Santa donation of ANY amount. 100% of your donation will go toward helping children of need right here in Utah County during the Christmas season! In the case of the Swell Christmas Santa Panel by Urban Chiks, HE HAS ARRIVED!!! 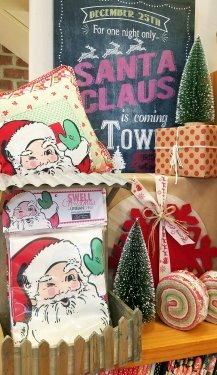 This digitally printed cotton panel is a whopping 60" x 52" and includes a Santa large enough to applique across the top of a quilt as well as a small Santa the size of the one stitched on the throw pillow shown here. Available now at the shop! Need a quick and easy Christmas quilt that can be ready to deliver in a hurry? Shannon White put this one together complete with delivery date using the Overnight Delivery collection by Sweetwater for Moda Fabrics. 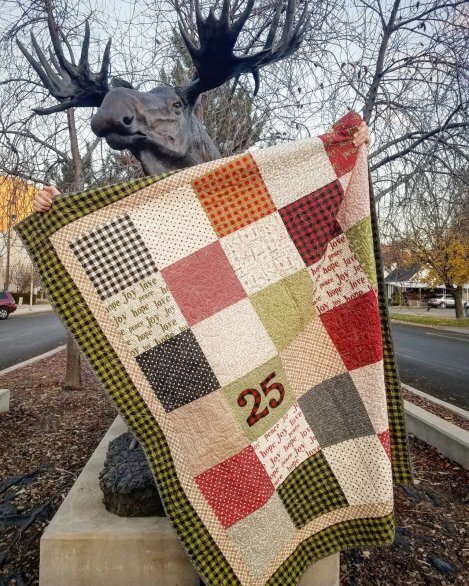 Simply sew together 10" layer cake squares, add a couple of borders and applique the numbers for a quilt that goes together faster than reindeer take flight (not to be confused with the fellow pictured here, Springville's own Mr. Moose. Doesn't he look charming in plaid?)! Kits available in-store! Speaking of Sweetwater Fabric; have you seen their latest collection? It's called Oxford and includes both prints and wovens in classic shades of denim, chambray, green and red. It's waiting for you here at the shop by the yard and in layer cakes! 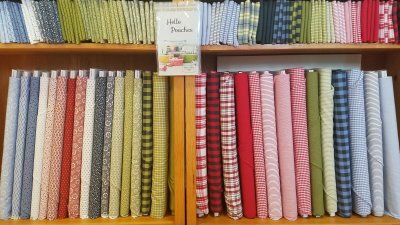 Monday, November 12th - 25% off WOOL! It's All About the Wool! Wool stitchers and wool rug-hookers, UNITE! Join our wool club to work on your own projects and get help when you need it here at the shop every 2nd Tuesday. Mary Jacobsen will teach you the best techniques for stabilizing, cutting, laying-out, and piecing t-shirts, ensuring those memories come together successfully in a way that will last for years to come. Register now in store or online!